El Sol and the Good Mother tell me in 6 months it will be 59 years, so many of you must by human nature, consider me an old man. I sure don’t feel like one and probably don’t act like one. The only tell tale of longevity being wisdom of experience. Nourishment to the soul. Earned exclusively by living long. Beyond the scope and understanding of youth. The biggest lesson, the real secret to living? The older you get, the faster time passes. The Relativity of Age. Savor every moment, every breath, every stride. The biggest gift of life? Being blessed with enough sunrises for that realization to come clear. I’d like to share that gift with you, tell you that old age is your reward for a good life. More immediate and thus infinitely more important! The Lincoln Marathon and Half Marathon in just two days! I’m not Thomas Bach, but I call our youth to come race. Those willing to give their very best. This is about you, your now, your time. This entry was posted in Uncategorized on April 29, 2016 by runguru. I spent several hours trekking along the upper bluffs of the Platte River yesterday. Hunting that elusive morel, I’d been o-for-the-season so far. What I found is amazing. Trudging and searching, I noticed the barest trace, a mere wisp of smoke, emanating from the hollowed crotch of a giant Cotttonwood tree. I approached very carefully not knowing what to expect. Nothing, just an old man, drawing on an ancient pipe. Wrapped in animal skins. Without glancing at me, patting the ground next to him. We sat quietly, watching and listening. After an age the silence was broken. “I am called Ta-Pooth-Ka, Man Who Speaks The Truth.” He had not seen another man in many seasons, a good life in the woods and along the river. We rose and walked a while. I had yet to speak, choosing to listen to this wise man. Hearing the ways of the various plants as we made our way through newly dappled shade. Occasionally pausing to point a knowing finger, no words necessary. I would follow his gaze, understanding in a new way. Feeling the beauty in the message. Seeing with clarity the truth. He sat again. As I squatted cross legged the morels came into view, a honey hole like I’ve never seen. How had he known? I selected the prize from among them and made my offerings to the East, and West, and North and South. We made our way back to his tree, my mesh bag fairly bursting. His hand went up signaling our time was over, the other sweeping towards his hollow, me understanding the invitation to return again. I still hadn’t felt the need to say a word. Slipping off into the waning afternoon I heard his final words. This entry was posted in Uncategorized on April 28, 2016 by runguru. The quadrennial celebration of the very best athletes, the very best stories, the very best competition, the very best of the very best. I’m already giddy, just can’t help it. Surprised? I think not. Anyone and everyone that knows me, has read me, likes me or not, understands that Potential Achieved gets me going. And the more potential realized, the more I like it. Introduce a little God Given Talent, now we’re really talking. Let’s be clear. We all have potential. Relative to our own bag of bones and dura mater. Challenges to overcome, dreams to chase, work to do. Talent doesn’t necessarily figure into this equation. Ah but Talent. If you’ve got that, Loyalty, Drive, Discipline and just a tad of Humility, well, how can I not be at your service? Somebody has to speak for the elites, that’s me. Al Sanabria called on Monday. We talked for over a half hour about his Boston Marathon. And about his aspirations, his future. Al doesn’t run for me but man does he get me. Nebraska Run Guru Elite, Inc. A USATF Competitive Club. Locally, Regionally, and Nationally competitive. Ready to toe the line and take on LRC Racing, Team Nebraska, KC Smoke, and Iowa Runablaze’s very best. USATF Competitive Club. Representing the Lincoln Marathon locally, regionally, and nationally. And every once in a blue moon, that athlete that dreams the Big Dream. USATF. Its about the Olympics. Thanks for the reminder Bob, you just gave me chills. This entry was posted in Uncategorized on April 27, 2016 by runguru. Life is like a leaf. If not anchored or attached, blown around willy nilly with no direction or destination. But hey, that’s not such a bad thing is it? A certain beauty in it to be sure. Freedom. Unencumbered. Destination unknown. Life is like a plant. Properly groomed it can be magnificent. Left alone it can more resemble a weed. And let’s go there, some of the most amazing plants I’ve ever seen are of that rangy, undomesticated variety. But a certain beauty, order, and function is found by pinching and pruning. The first set of leaves, signaling a successful sprout, bringing energy and life to the plant. Hard fact of life is that if you pinch those, decorative but likely spent, the rest of the plant’s vitality and growth improves dramatically. Sometimes you’ve got to rogue. That’s always the hardest part for me. Yanking a mature plant, often that I tended and serviced with my best efforts. Sometimes a little too close to another plant, limiting the growth of both. Sometimes a single spot of blight, if not removed a threat to the entire garden. Sometimes, simply not bearing the fruit you had hoped for. Life is like a garden. My garden’s future depends on pinching and pruning and rogueing. Yes, life is like all that. This entry was posted in Uncategorized on April 26, 2016 by runguru. Congratulations to my young charge Sam, speedy 7th grader took 4th overall (18:54) in the Clausen/Leahy 5K this weekend. Over there on the Omaha Running Club facebook page, a lot of the participants are chiming in with “constructive” criticisms regarding the shoddy management. Running out of water ,no mile markers, too crowded, (what do you expect when running on a sidewalk?). The Midtown dilemma. This entry was posted in Uncategorized on April 25, 2016 by runguru. Logan Watley. I tip my hat to you. 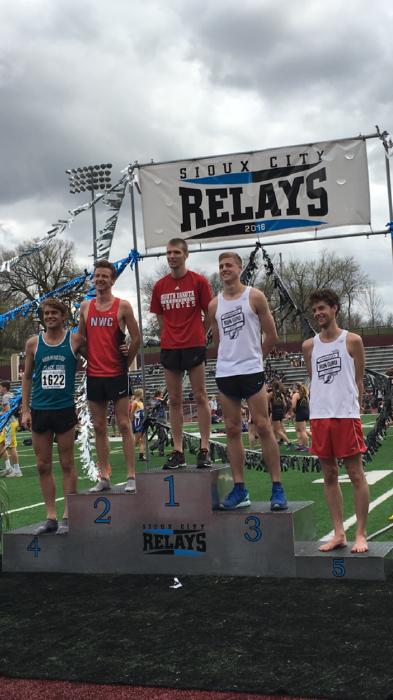 Last night Michael Rathje (10th, 31:22), Johnny Rutford (13th, 31:28), and Ryan Dostal (16th, 32:01) all raced the KU Relays 10000 meters. Track racing! Real Racing. Nowhere to hide racing. Juevos mas Grande Racing. That’s the spirit! I’ve spent a decade and a half trying to raise the bar. That bar, for now in Logan’s capable hands. And he doesn’t take it lightly. Getting his mates on the same page, focused, bows pointing all in the same direction. Team Spirit. Not an easy thing to cultivate or maintain. Again, a big tip of the sombrero. Add in his duties as our LDR Chair, working taxpayer, and family man and you can see why I admire and appreciate everything this young man is doing. He has demonstrated motivational and organizational skills far beyond my scope of professionalism, to the benefit of us all. Less than 10 days until Lincoln. Weather looks good. And you can tell who’s ready to roll. This entry was posted in Uncategorized on April 22, 2016 by runguru. Clean as a whistle. I’ve spent the last couple of days baring my life history. Background checks with the National Center for Safety Initiatives, TC logiQ, Inc., and finally the USOC’s Safe Sport Training Program. For all my brash, bluster, and bullishness, I’m really just a pussycat after all. Double naught spy? Nah, just getting properly certified with USATF. What, you may ask, is up my sleeve this time? Taking my coaching to another level. Overdue. Jeremy Morris broke the Free State Trail Run cr by 11 minutes. And still finished 12 minutes behind the winner Jeff Browning. That’s some crazy speed. Jeff Gregg has a Boston tale of a lifetime. Drove to Denver (cancelled flight), drove to KC (trip to ER with flu in the middle of somewhere), flight to Boston, makes the start line, finishes race. I can’t wait to meet this mate of mine, I like the cut of his jib. LivewellNebraska.com Athletic Ombudsman Michelle Bandur has struck up a firestorm with her column claiming bicyclist’s stakes to the highways of Nebraska. Our Little Slice is a mecca for these spandex suited speedsters, whizzing by alone or in groups, always on the weekends. I’ve been struck by their fearlessness. Pacific, Blondo, Dodge, Maple, and especially 264th St. Flat as a pancake and fast as you want to go. Its not their speed that awes me though. Its the speed of the traffic sharing the roads. Mine own two eyes witnessing half the vehicles staring at something in their laps as they hurry, hurry, hurry, connected, connected, connected. No shoulders. Deep, deep ditches. I see the tandem trucks hauling sand from future subdivisions. The farm equipment. The idiots. The distracted. And the memorial crosses peppered throughout the landscape, none more poignant than the bike memorial of Millard West teacher Jim Johnston. I hear the wail of sirens spreading between these two rivers. Sometimes you can be so right. Dead right. This entry was posted in Uncategorized on April 21, 2016 by runguru. Get out there and run in this. Stay off the treadmills. You’ll thank me later. That is all. This entry was posted in Uncategorized on April 20, 2016 by runguru. Not for the last time, Cruel Mistress! The marathon, uncaring flogger of dreams. Most every vision of euphoria was dashed, downed like the falling mercury. As difficult as it is to run a warm marathon it is harder to run a warm marathon that cools significantly over the second half. Reminiscent of my and Linda’s last, Grandma’s 2012, where we both dropped with hypothermia. Our hearts go out to those dealt the lashes yesterday. Takeaways for me, the Kenyans have been unclean for years. The Ethiopians probably are too. Zach Hine, he of the 1:04:48 at the Twin Rivers YMCA Freedom Run Half Marathon, was 10th overall and top American. Bar None buddy As Sanabria was 25th overall. Emily Kraus ran a 7 minute personal best, she was well prepared. I’ll be working for the third year with Sam and Jackson. Sam, precocious if not wunderkind, running as a 7th grader, set the Beveridge Middle School record in the mile, 5:06 a couple weeks ago. Big goals for the summer. Another Bar None protégé, Linda’s nephew Noah, now a freshman at Burke HS and running varsity hurdles. This entry was posted in Uncategorized on April 19, 2016 by runguru. A lot of Boston jitters right now, just a little while until the cannon booms. There will be tales of a lifetime shortly thereafter. For now I’ll glance back at the weekend. Start with the Debs up at the Sioux City Relays. Jay Welp (1:58) opened up by anchoring his Morningside Alumni team to the win in the 4 X 800. Drew Prescott (15:40) led the mates to a 3-4-5 podium finish with Jay (15:53) and Kevin Joerger (16:04) rounding out the effort. Winner winner chicken dinner. I got ahold of Nancy Sutton Moss, described what I’m about to share with you. Saturday morning, one of the windiest of the spring, two lone figures. An easy mile and a half warm up, then 15 miles at Half Marathon Pace + :20. Let that settle in for a moment. Simply flying with the wind, glorious labor against it. Me astride, Grant Wintheiser afoot. One or two mile stretches at a time into the howling teeth. Me insisting it is our friend, making us strong and wilting our opponents. First 3 miles spot on in 16 flat. At mile 4 a grin and “I’m starting to get revved”. Six miles under 32. And the wind, always the wind, sometimes all I could do to keep up. Around 53:10 for 10 miles. Me now pedaling the fat tires furiously for the last hard mile into the wind, Grant happily chiming that one in 5:17, 1:09:30 through the half and 15 miles in 1:19:30. 5:18 pace for 15 miles on a day better suited to sails and kites. Nice work fella. Great racing to everyone in Boston this morning. Our mates Cameron Cummings, Jeff Gregg, and Stacy Mangers Shaw will give it their all. I’ve written down my projected times for a few people and shared it closely. I don’t need race day tracking, I’ve been tracking training all spring. Looking forward to the post race! This entry was posted in Uncategorized on April 18, 2016 by runguru.